St. Paul, the capital of the state of Minnesota, sits on the east bank of the Mississippi River and has a population of approximately 300,000 people. 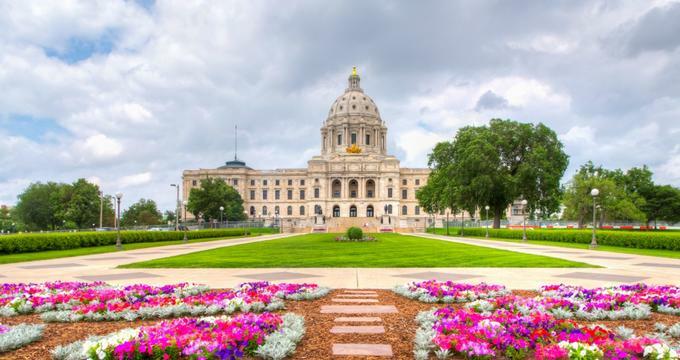 The city is a business and cultural center with an array of museums, performing arts centers, and historical sites, and it is also home to the Minnesota Wild of the National Hockey League. The Mississippi River and its shores are much-loved recreational space in all seasons. Overlooking the Mississippi River in St. Paul, the Science Museum of Minnesota is a large regional science museum that uses a hands-on approach to science learning and entertainment. Founded in 1907, the museum features a variety of permanent and temporary collections and exhibitions, state-of-the-art research facilities, a public science education center and an Imax Convertible Dome Omnitheater. Five permanent galleries and an array of temporary exhibits cover the topics of physical science and technology, the human body, paleontology, and the peoples and cultures of the Mississippi River. Popular collections and exhibitions at the museum include the interactive Experiment Gallery, an authentic Mississippi River towboat, an ancient Egyptian mummy, and a variety of interactive exhibits for all ages. The museum offers innovative and interactive science education programs for teachers and children, and provides ongoing research in a range of scientific fields. Alexander Ramsay (1815-1903) was the first governor of the state of Minnesota; his term lasted from 1849 to 1853. In 1872, Ramsay had a house built in the Irvine Park district of St. Paul. This house still stands and is one of the best preserved Victorian homes in the United States. 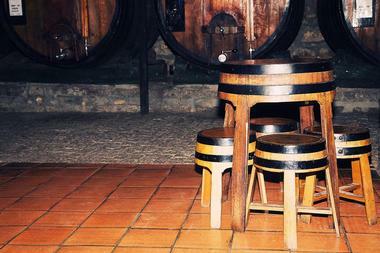 Many of the original furnishings are still intact. 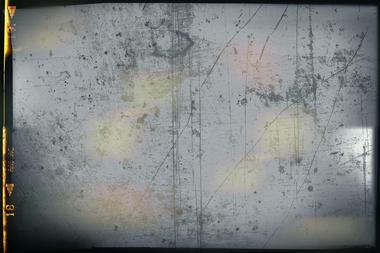 The house was very advanced for its time: it had hot and cold running water, gas lighting, and hot water radiators. 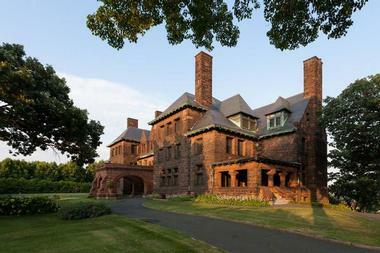 Upon her death in 1964, Anita Ramsay, Alexander’s last surviving granddaughter, willed the house to the Minnesota Historical Society. One-hour tours are offered by docents in period costume; the servants in the kitchen often have children on the tour help them do kitchen chores and baking. The Bruce Vento Regional Trail is an asphalt-paved rail trail that runs from White Bear Lake to the Bruce Vento Wildlife Sanctuary. Both the trail and the wildlife sanctuary are named for Bruce Vento, an ardent environmentalist and a member of the U.S. House of Representatives representing Minnesota’s 4th District from 1977-2000. The trail is mostly off-road, but it does go through some residential neighborhoods; it is scenic, with views of Lake Phalen, and a lovely ravine section in Swede Hollow. 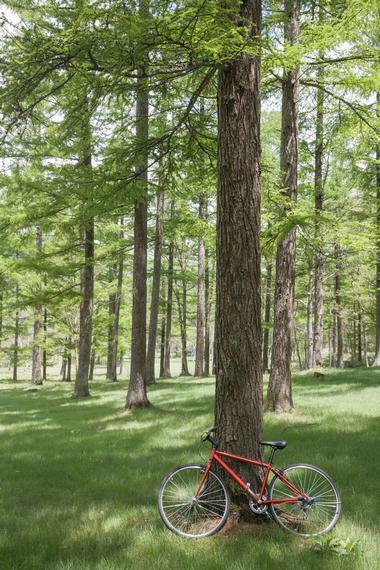 The trail is seven miles long and is open to hikers, cyclists, in-line skaters, and cross-country skiers. It is wheelchair accessible. The Cathedral of Saint Paul is one of the largest Roman Catholic cathedrals in the United States and is the Co-Cathedral for the Archdiocese of Saint Paul and Minneapolis. Opened in 1915, the cathedral was built in the majestic French Beaux-Arts style of architecture, and its distinctive copper dome rises 186 feet above the nave. The open plan interior allows everyone an unobstructed view of both the pulpit and the altar. 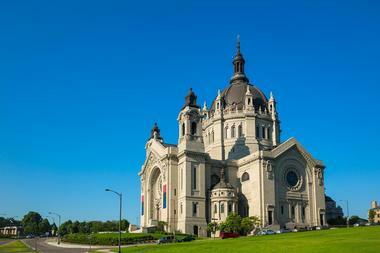 The Cathedral is enormous with seating for 3,000 people and a magnificent building of granite sitting on a hilltop overlooking downtown Saint Paul. Statues of the four evangelists are placed in niches around the church. There is free parking across the street, and visitors are welcome to tour the cathedral at all times except Sunday mornings. Como Park Zoo and Conservatory are part of a large complex on the shores of Lake Como that includes an amusement park, a golf course, a pool, and a carousel. The zoo is the oldest in Minnesota; it was opened in 1897, and in its first year it was home to three deer. 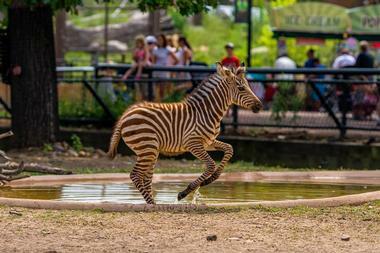 Now the zoo has extensive animal collections, including birds, a wide selection of primates such as lemurs, orangutans, and Western Lowland Gorillas, big cats such as lions, tigers, and snow leopards, as well as zoo favorites such as polar bears, wolves, giraffes, and zebras. The Marjorie McNeely Conservatory is open to the public every day of the year and presents beautiful botanical items. It has a display of bonsai trees, a Japanese garden, a palm court with over 150 species of palm, an orchid house, and a greenhouse dedicated to ferns. There is no admission charge to either the zoo or the conservatory. 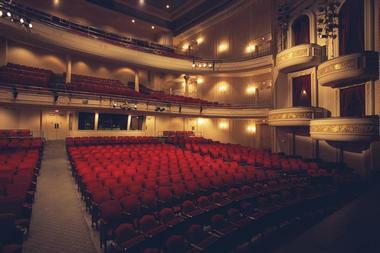 The Fitzgerald Theater was named for author F. Scott Fitzgerald, who was born in St. Paul and spent some of his formative years here. National Public Media’s live radio show A Prairie Home Companion is recorded here. Until his recent retirement, Garrison Keiller hosted the show. James J. Hill was a railroad magnate in the 19th century; he founded Great Northern Railroad. In 1891, he had a house built for himself, his wife, and their ten children, and he resided there until he died in 1916. 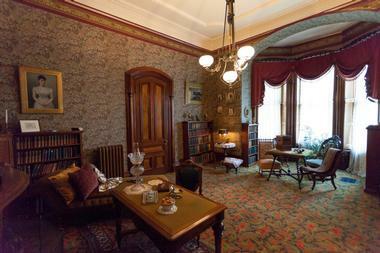 The Minnesota Historical Society now manages the house and gives tours to individuals, groups, and school students. 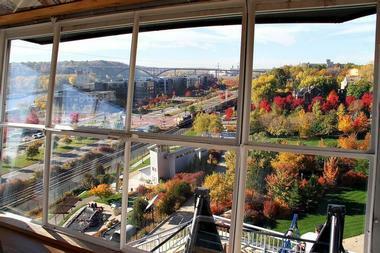 The house has a commanding view of downtown St. Paul and the Mississippi River, and is ruggedly styled in stone. It is a massive house with intricately detailed woodwork inside, as well as all the latest conveniences of the time such as indoor plumbing, secret safes, and electric light. The house also has a pipe organ, which is regularly used to present chamber music concerts. Visiting the house is a fascinating way to learn about the lives of rich people and their servants during the Gilded Age. The Minnesota History Center consists of a museum and a library and is home to the Minnesota Historical Society. The eye-catching building with two L wings joining at a central dome was completed in 1992. There are both permanent and rotating exhibits, all of which are family friendly and designed to appeal to both children and adults. There are always films being screened, and they add to the historical experience and provide an interesting form of education. The museum hosts dance performances, lectures, concerts, meetings, and weddings, and it has a nice café and gift shop. The Minnesota Transportation Museum is housed at the Jackson Street roundhouse, one of the few roundhouses in the country that is still fully functional. Volunteer docents give visitors a tour of the museum’s train yard, which includes many locomotives, Pullman coaches, baggage cars, and mail cars, and gives visitors the opportunity to take a short trip in a heritage caboose. 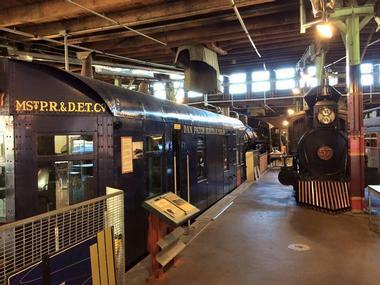 There are many hands-on exhibits that will delight children as well as adults; there is also a machine workshop where train renovations are on display. The price of admission also includes a tour of St. Paul’s downtown in a 1953 GMC bus. The Mississippi National River and Recreation Area has a misssion to preserve and demonstrate the natural and population history of the river. This seventy-two mile corridor of the Mississippi passes through St. Paul and has two visitor centers in the St. Paul area. The visitor centers are staffed by rangers and present a wide variety of exhibits related to the Mississippi, past and present. The park is an ideal destination for fishing, boating, camping in the summer, and ice fishing in the winter. Bird watching, hiking, and cycling along the banks of the river are popular activities for locals and tourists. Joan’s in the Park is an excellent, upscale St. Paul restaurant in the Highland Park District, which prides itself on its superb customer service. It specializes in seasonal North American fare and pairs its offerings with its excellent wine list. The small, lively, attractive restaurant serves a large variety of seafood: clams, crab toast, shrimp with corn dumplings, scallops, and fish. The entrees are mainly meat. Patrons rave about their desserts, which include cinnamon custard, brown butter pudding, and strawberry shortcake. Reservations are recommended, as the restaurant is small and usually operates at full capacity. 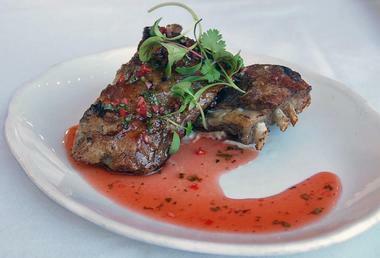 Meritage is a fine dining restaurant in downtown St. Paul. From the moment the door opens, diners are swept into this cozy restaurant with a truly French ambience. Diners may eat and drink at the oyster bar, or in the elegant main dining room; in the summer there is an outdoor terrace on which to dine. The restaurant places a heavy emphasis on seafood; in addition to oysters there are shrimp cocktail, clams, lobster, swordfish, sandwiches of grilled tuna, and a salmon salad. Many diners order its justly famous cassoulet. For after dinner there are an interesting and tasty selection of desserts and artisan cheese. 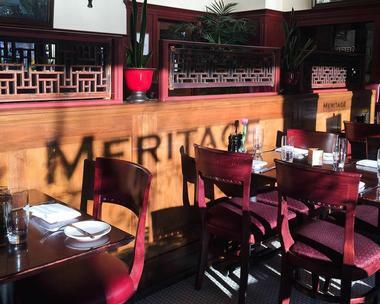 Meritage is open for lunch, dinner, and for Saturday and Sunday brunch; reservations are recommended. 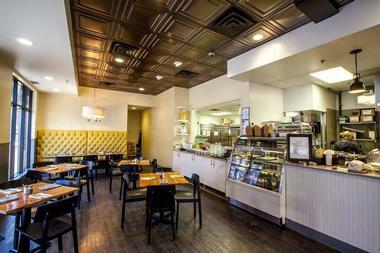 The Buttered Tin is a café and bakery highlighting American breakfasts and comfort food. Patrons can visit for breakfast, lunch, or for coffee and relax in butter yellow booths or outdoors on the seasonal patio. The menu consists of a vast variety of egg dishes, hash browns, breakfast tacos, biscuits and gravy, pancakes, homemade granola, and French toast with rum-flamed bananas. For those wanting more substantial fare, the menu includes salads, burgers, and sandwiches. The excellent bakery has every sweet lover’s dream, and the coffee cake and cinnamon rolls are particularly delicious. 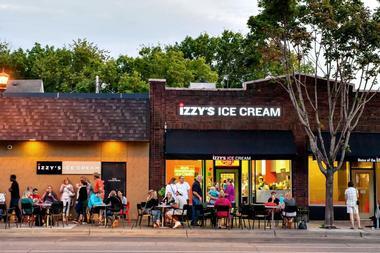 Izzy’s Ice Cream has been a St. Paul institution since it opened its doors in 2000. Family owned and operated, the ice cream café has won major awards for its excellence, and it has been featured on The Food Network. Izzy’s is a café with a conscience; it is powered by solar panels, and it sources its ingredients locally wherever possible. The café has all of the usual favorites, plus its very own signature ice creams that include basil, buttermilk, ricotta, ginger, eggnog, pomegranate, Guinness, and brown sugar bourbon. For kids there are fun flavors like bubble gum, cotton candy, marshmallow, dinosaur egg, and the intriguingly named Spongebob. A line of dairy-free sorbets is always available at the café. The Wabasha Street Caves are sandstone caves on the south shore of the Mississippi River that have been transformed over the past hundred years into event space. In the 1920s, the caves were home to a speakeasy during the Prohibition Era, which was reputedly frequented by gangsters such as John Dillinger and Ma Barker. A restaurant that opened in the caves was shut down at the beginning of the Second World War, and it remained closed until the 1970s when the space became a disco. Today the Wabasha Street Caves are a great place to have lunch. They have Swing Nights on Thursdays, featuring live big band music, and the caves are popular for private events. A small gift shop in the caves sells cards, crafts, trolls, and jewellery. The Ordway Center for the Performing Arts was the brainchild and philanthropic venture of Sally Ordway Irvine, whose family owns 3M. This large, superb performing arts venue, which opened in 1985, presents a dizzying array of shows, including Broadway musicals, family events, classical music, dance, and opera. The sight lines in the 1,900-seat theater are terrific; there is not a bad seat in the house, and the acoustics are excellent. Wheelchairs are easily accommodated, the staff is very friendly, and the lobby bar serves drinks and snacks. 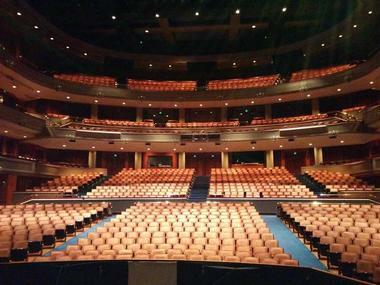 The Ordway Center has educational programs for school groups, children, and adults, and it hosts an international children’s festival each year.